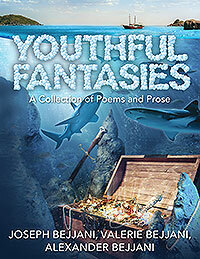 Joseph Bejjani, Valerie Bejjani, Alexander Bejjani’s “Youthful Fantasies.” Enter the Wondrous World of a Child’s Imagination — a collection of poetry directly from the creative minds of young authors. Unlock a realm of creatures, gods and goddesses, common cravings of children, fancied adornments, the simplest elements of nature, the hardships of growing up, and nighttime beauties, peppered with pithy text and illustrative drawings. Let curiosity carry you through the stories as you embark on a journey filled with happiness, sadness, and everything in between.